Anna's Quest is a fable-driven, black comedy 'point and click' adventure game that's inspired by The Brothers Grimm & Hans Christian Andersen... with a sci-fi twist! 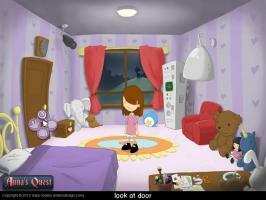 "Sughly's adventure game places you in the role of Anna, the plucky and cute-voiced test subject of an evil witch. The variety of puzzles tend to be a good mix of challenge and common sense while the visuals keep you involved. Overall this is a highly recommended game." The animations in this game are beautiful, and the limited locations never seem too confining, due to the work needed to access each new room. The best part though, is the voice for Teddy. So full of character, and adorable. Looking forward to Chapter 2. Visually, this game is very attractive. Each room looks as good as the screenshot you can see on this page, and the characters are very animated for an AGS game. There are some puzzles that are traditional, and also some that are quite inventive with the added option of using telekinesis on different objects. I was very impressed with the speech dialogues in this game too. The main characters voice can get a bit wearing though if playing for a long amount of time.